Higher wages were a key plank of the 1968 Poor People’s Campaign to reduce poverty. But over the last five decades the real (inflation-adjusted) value of the minimum wage—a key tool in the fight against poverty—has steadily eroded. Figure A. Snapshot provided by the Economic Policy Institute depicting Ben Zipper's calculations from historical federal minimum wage values, and average 2016 poverty thresholds inflation-adjusted to 2017 dollars from U.S. Census Bureau, “Income and Poverty in the United States: 2016”, September 2017. View the full interactive data chart that displays statistics for each individual year here. Minimum wage increases have been too infrequent to keep up with inflation, let alone raise the real value of the minimum wage above where it was in 1968. While a full-time minimum wage worker in 1968 would have earned $20,600 a year (in 2017 dollars), a worker paid the federal minimum wage in 2017 could only earn $15,080 working full time. 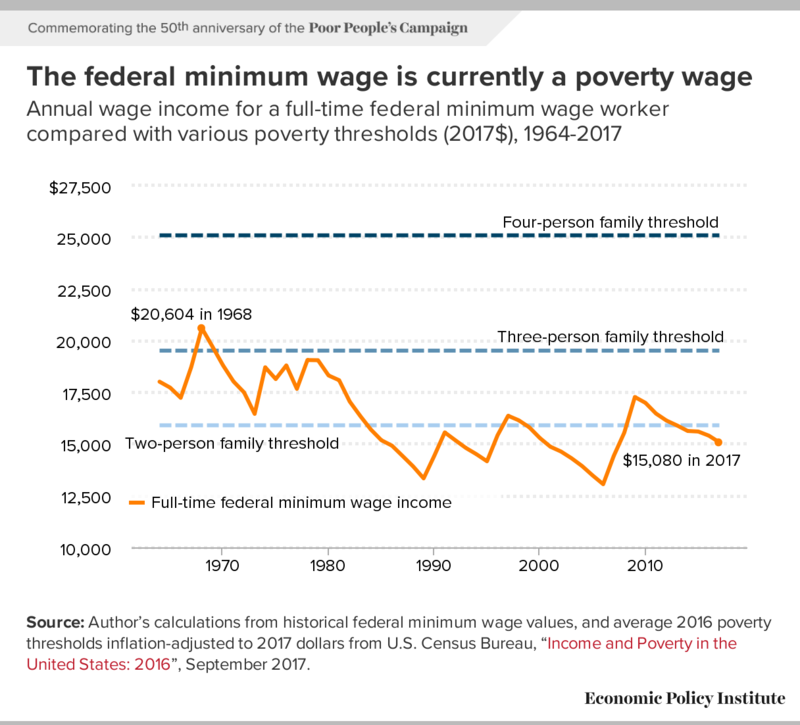 Figure A compares these full-time minimum wage incomes to poverty thresholds for different family sizes and shows that, today, a single parent of one child would be consigned to poverty if that parent earned the federal minimum wage. The fall in the inflation-adjusted minimum wage over the last five decades has made poverty rates substantially worse, particularly for people of color. More than one out of five nonelderly black and Hispanic people lived in poverty in 2016, or about 18.3 million people. (Interactive Data Chart). While poverty has a variety of causes, one important contribution is low wages. Some states have minimum wages higher than the federal minimum. In 2016, the average state and federal minimum wage was $8.28 per hour. But had the effective value of the federal minimum wage not fallen since 1968, the average state and federal minimum wage would be $9.70 today. The most comprehensive assessment of the effect of the minimum wage on family incomes (PDF) finds that every 10.0 percent increase in the inflation-adjusted minimum wage reduces black and Hispanic poverty rates by about 10.9 percent. Had the federal minimum wage been raised to keep up with inflation since the Poor People’s Campaign began in 1968, black and Hispanic poverty rates would be 18.2 percent lower, and nearly 3.3 million African Americans and Hispanics would no longer be in poverty. More about the economist, Ben Zipperer, and his analyses at the Economic Policy Institute. Thanks to Ben Zipperer and EPI's Communications Director Dan Crawford for permission to share their research snap shot!